Pool Cover Roller - Which Type Do You Need? You are at:Home»Pool Covers & Rollers»Pool Cover Roller – Which Type Do You Need? Pool Cover Roller – Which Type Do You Need? The benefits of having a pool cover are well known: they keep the water warmer, they keep out leaves, bugs, and dirt and thus cut down on cleaning times, they prevent evaporation, and they reduce chemical loss. All that’s great. But, if you’ve got a pool cover, you need a pool cover roller, otherwise known as a pool cover reel system. Full disclosure here, we do sell pool cover rollers but adament that unless you have a very small (3x3m or smaller) plunge pool, you’ll need a roller. Just ask anyone who already has a cover. Look at it this way: you know how hard it is to fold a large bed sheet? Well, unless you’re King Og of Bashan whose bed, according to Deuteronomy 3:11, was 9 cubits long and 4 cubits wide, your pool cover is a lot bigger than your bed sheet. In fact, even if you are King Og of Bashan, your pool cover’s still a lot bigger than your bed sheet. And your bed sheet isn’t (a) made of plastic, and (b) soaking wet (although, if it is, don’t write in and tell us; we don’t want to know). The point is, with a roller, getting a pool cover on and off is a breeze – the whole operation takes less than a minute. Without a roller it’s a major pain. Solar pool covers may be relatively lightweight, but they’re still big. And wet. Thermal pool blankets aren’t just big and wet – they’re also heavy. So, in terms of simply making life easier alone, depending on the type of pool cover you have, you either need a pool cover roller, or you really need a pool cover roller. If you take off a pool cover manually, there’s a good chance that it’s going to get dragged over rough ground, rocks etc., and thereby possibly get scraped or torn. A pool cover roller, however, removes this risk entirely – thereby increasing your pool cover’s lifespan. The whole point of having a pool cover in the first place is that it doesn’t just keep your pool warm and cuts down the cleaning time, it will reduce your pool’s running costs by around 50% or more. However, you’re only likely to realise the cost savings if you’re using your pool cover as often as you should. And the easier the process of taking the cover on and off, the more likely it is that you’ll do so. Manual rollers are the most common, and least expensive type or pool cover roller. They are usually made from either stainless steel, aluminium, or a mixture of the two. 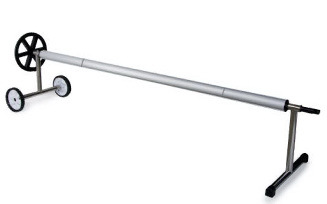 Most usually they have a central telescopic pole, thereby making them readily adjustable to most sizes of pool. The way they work is simple enough. On one side there is a either a crank handle or a wheel. When you want to uncover the pool, you wind the handle/wheel and the roller neatly rolls the cover off the water. When you want to close the pool, you simply take hold on the edge of the cover or, if your cover’s got a cord, take hold of the cord and walk with it down to the other end of the pool. Manual pool cover rollers are available as either static or mobile units. • Bulky, and take up a fair bit of space. • Not exactly pleasing on the eye. • Can be problematic for non-rectangular shaped pools. 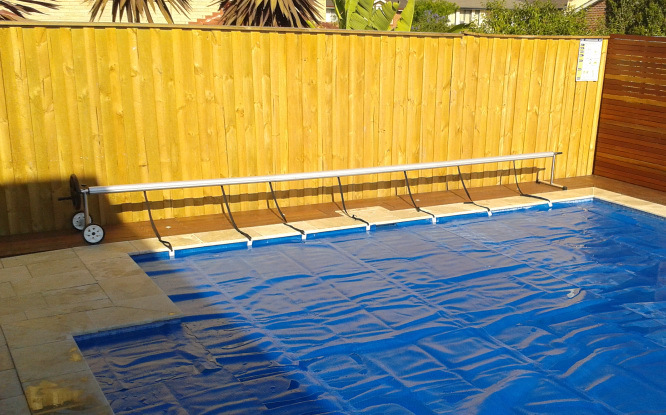 For more information on manual pool cover rollers, Click Here. Automatic pool covers, at their most basic, are essentially manual pool covers with a motor that does the cranking or wheel turning for you. Frequently, they still feature the manually-turned handle/wheel as a backup. These more basic automatic rollers are only automatic when it comes to uncovering your pool. To cover it, you’re still going to have to grab the corner of the cover and walk it down to the other end. Not that that’s such a chore – and they take all the work out of cranking/winding the cover off. • Electric Powered – self-explanatory. • Solar Powered – solar cells use the sun’s energy to recharge the unit’s batteries. • Water Powered – you attach a garden hose to one side of the unit, and place the unit’s outlet hose into the pool. The water flow causes the roller to turn and, thus, uncover the pool. • No manual work involved in opening the pool. • You’ll look cooler in front of your friends. • More expensive than manual rollers. If you have a bigger budget, if you’re concerned with the aesthetics of more standard pool cover rollers, or you really want to feel like James Bond, or at least one of his wealthier villains, hidden pool cover rollers are a great, and undeniably impressive, solution. Basically, the roller unit is “hidden” in a compartment that is buried either in the ground, pool surround, under the deck, or behind a water feature. The top of the compartment is usually either aluminium or wood, and fits entirely flush with the pool surround. Hidden pool cover rollers can be either manual or automatic. Some types of hidden pool cover rollers are track-guided – i.e. the pool cover is guided by tracks either mounted on the surface of the pool surround or else under the pool decking. • Takes up no visible space. • Track-guided systems are generally only suited to rectangular shaped pools. Fair enough, above ground swimming pools may not exactly be the kind of thing you see in 007 movies, but that’s not reason why they don’t also need pool covers. And it’s equally no reason why they shouldn’t benefit from pool cover rollers. Pool cover rollers for above ground pools are usually annual, free-standing, height adjustable units, most frequently with a drop-pin system that anchors the feet in place. Pool cover rollers don’t just make covering and uncovering your pool infinitely easier; they’ll ensure that you get the most out of your pool. And, when it comes to pool running costs, the least taken out of your wallet. Hi, i am looking for help. I have a motorised pool cover but the electric drive motor has given up, is it possible to purchase just the motor , it is for 100 mm dia aluminium roller.